Busy Stevie Lyle continued his summer shopping spree this week as he looks to piece together a new-look Swindon Wildcats side capable of taking on the best in the English Premier Ice Hockey League. The new ‘Cats coach further strengthened his roster with the re-signing of utility player Lee Richardson, player-assistant coach Kenton Smith and forward Floyd Taylor last week and the Welshman has pulled out another new face today, in the form of talented prospect, Harvey Stead [pictured centre]. Despite having options to play abroad and from other EPIHL clubs, Stead the former Bracknell Bees defenceman opted to join the Wildcats having spent the last two years with the Bees where he made 82 appearances, scored 2 goals and made 12 assists. “I felt like I needed a change of environment and scenery after a tough 2014-15 at Bracknell,” the 19-year old said after agreeing to the switch. 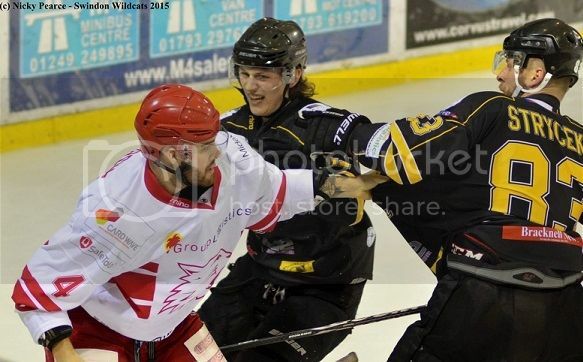 The player, who was born in Reading, was a solid figure in the Bees affiliate sides having begun his career in the Stingers during 2009-10 and made over 40 appearances in the clubs NIHL side between 2012 and 2014 and he admitted that coach Lyle played a big part in helping him decide his development lay in Wiltshire. “After speaking to Stevie [Lyle] at length about the team and how he wanted to play, I knew it’d be a good fit for me to develop and to take my game to the next step,” he continued. “Swindon have always been competitive every season and after seeing how other guys have developed whilst playing at the club, I knew it’d be the right choice for me join and push on with my development. With Stead having already played with Floyd Taylor, Michael Stratford, Toms Rutkis, Matt Selby and Jordan Hedley at GB level, the talented player said he is confident that the team can do well. “I know quite a bit about the team he [Lyle] has put together and I’m excited to get started and play with the rest of the guys,” Stead continued. “It’s a very competitive, hard-working and skilled team which will play a good brand of hockey and who will be looking to compete in every game, and win many of them. “Stevie has brought in quite a few new faces including myself, but we’re no strangers to one another. He’s kept the good strong core of guys from last year and added to that with the new additions, so hopefully it all work well and will be celebrating success at the end of the season. In all, it’s capped a busy week for Lyle, who also confirmed he is looking to bring one final new face to the club this week. Sponsorship opportunities starting at just £5 are available for Harvey. For further information on how you or your business can get involved, please call Wildcats Marketing Manager Sally Price on 01793 886 857. Swindon Wildcats Early Bird Season Tickets for the 2015-16 season are currently on sale. Supporters wishing to take advantage of the 2015-16 Early Bird offer can pick up an application form from the Wildcats Office or download one HERE. Fans wishing to pay for their Early Bird ticket on a monthly basis should request a standing order form from Lauren Nell via email (at: lauren@swindonwildcats.com) or by calling the Box Office on 01793 886 857. Sponsorship opportunities starting at just £5 are available for various players for the 2015-16 season. For more details, please call Wildcats Marketing Manager Sally Price on 01793 886 857. Visit swindonwildcats.com throughout the offseason for news and updates on our summer appearances, events and much more. For more information, call the Wildcats office at 01793 886 857, “like” the Swindon Wildcats Ice Hockey Club on Facebook or follow @SwinWildcats on Twitter.